This last week I walked the American Discover Trail (ADT) segment 3 from French Meadows to Michigan Bluff. My main purpose was to get a GPS track that I had missed and messed up before, and I succeeded in that, see below. This was the second part of a backpack trip into the Granite Chief Wilderness, and I did not have any ADT information with me, so I was going on memory to find the trail. I did. I have to admit a few sections did not look all that familiar, but the junctions did. The trail is much better marked than it used to be, not as the ADT, but as the Western States Trail, particularly from Robinson Flat to the west, which is the route of the Tevis Cup horse race and Western States foot race. New signposts have been placed at nearly every trail junction, and several places along the trail. After walking out of the Granite Chief Wilderness at Picayune Valley, I started this segment at Lewis Campground with is on French Meadows Reservoir, walked a short ways in to Poppy Campground and spent the night. The next day was the long day, 27 miles, and I was pretty tired. The official ADT routes includes a section on Barney Cavanah Ridge, from T30170 to T30175, that I strongly recommend you skip. The first part is very steep and eroding, then it crosses a huge logging deck with no indication about which way to go, then it heads down a long ridge that would be OK if not for the hundreds of small trees down across it. Instead, just continue on Forest Road 44. It is longer and boring, but not frustrating. I doubt this this section was ever part of the historical Western States Trail, as it swings so far north of its destination of Last Chance Ridge. I don’t have any information about the historical route, but the parts still in use are much more direct that this. Don’t miss getting water at Deep Canyon Creek, as there may not be any other sources until North Fork of the Middle Fork American River. I camped beside the North Fork at the suspension bridge. There is very little flat ground here, just a small sandy beach, but it is a special place to be. Next day, up to the ridge. There is a pump handle at about T30270, where the trail joins the road. It may really be from a tank and not a well, as a well on top of a ridge seems unlikely, but nevertheless, a source not to be passed up. The trail then drops gradually to Eldorado Stream, where there is ample camping space if you want that. And then up the ridge, again, to Michigan Bluff. This section is shadier than I thought it would be, so not bad on the hot morning. My muscles were ready for the remaining six miles into Foresthill, but my feet were not, so I hitched a ride, had a beer at the Mtn Club, and then hitched the rest of the way into Auburn for the Capitol Corridor train home. For earlier ADT posts, see https://allisondan.blog/tag/adt/. I first hiked this segment in July 2012, repeated it once but apparently did not post on that trip, and also walked from Auburn to Eldorado Stream once. Every year or two I head out to southern Utah with my friend Joe Herbst and his animals, horse Sassy and mule Ruby. This spring break we went to Cottonwood Canyon and Cockscomb Ridge. The dirt road runs between Highway 89 east of Kanab and Highway 12 east of Bryce Canyon. Cockscomb Ridge is a ridge line of upturned sedimentary rock, most prominently Navajo Sandstone, and is also the East Kaibab monocline, the warp that raises the north rim of the Grand Canyon to high elevation. The sedimentary beds are steeply tilted, though east and west of the fold the rocks are nearly flat lying, more like the traditional picture of the Colorado Plateau. We camped near the road, two nights, opposite Hackberry Canyon, and then two nights at a tucked away campsite behinds a ridge of Entrada sandstone. The first two nights were cold and windy, so we used Joe’s Tentipi and roaring titanium wood stove, the the weather warmed and the wind dropped for the other two nights. The first riding day we went up Hackberry Canyon, a stream that flows through the Cockscomb in a very narrow but very rideable canyon. Once through the Navajo sandstone, it widens a bit in the brilliant red Kayenta formation and multi-colored Moenave shale. Eventually the strata dips back down and the stream passes through a much rougher narrow canyon, still passable. At that point we turned back to camp. At the beginning of the upper narrows, the historical Watson cabin is being restored, but with questionable methods. Plastic tarpaper?? We saw a few longhorn cattle up in the upper section, and on out way out, ran into the cowboys who were going to gather them for a move to summer range. We also saw longhorns near our camp that evening. The second day we rode up Road 430, the Brigham Plains Rd, which climbs at a remarkable angle up through the Dakota, Tropic, Straight Cliffs and Wahweap formations to the mesa above, which seems to be called Brigham Plains. We headed south across the mesa, following a ranching road that passes dry cattle tanks, and eventually found an extensive catchment of roofing metal with a underground tank and watering trough with water. This is a seldom visited place, with far distant views and a sense of openness that doesn’t exist below. It seems the road eventually goes to Coyote Canyon, but that was far beyond out ride. We walked the animals back down the steep road, playing it safe. The third day we rode down Cottonwood Wash, which is flowing most of the way with water from Hackberry Canyon, though it sinks away before reaching the Paria River. The Paria Box is another narrow canyon cut through the Navajo sandstone of the Cockscomb by the Paria River, from its source on the east side of Bryce Canyon. The canyon is nowhere as narrow as Hackberry, but has more water. In the wide middle section of the canyon, the river braids across a wide flood plain, and the aggrading leaves a fine muck that must be unpleasant to backpack in. We visited a historical cabi and surrounding development on the north side of the river, and the Paria cemetery on the south side. The hills of brilliantly colored Moenave shale in this section is the highlight. We hardly saw a flower or green plant. Perhaps early in the year, but more likely the result of drought. The soul is damp not far down, but the rain may have come too late for grass and flowers this year. The cattle were largely surviving on munching shrubs, and tiny bits of last-year grass. Evenings were spent around the ‘campfire’ of Joe’s little wood-burner gasification stoves, eating dinner, telling stories new and repeated, and heading off to sleep. The moon was nearly full Thursday night, but many stars were still visible, Sirius up first and Orion and many other constellations eventually. 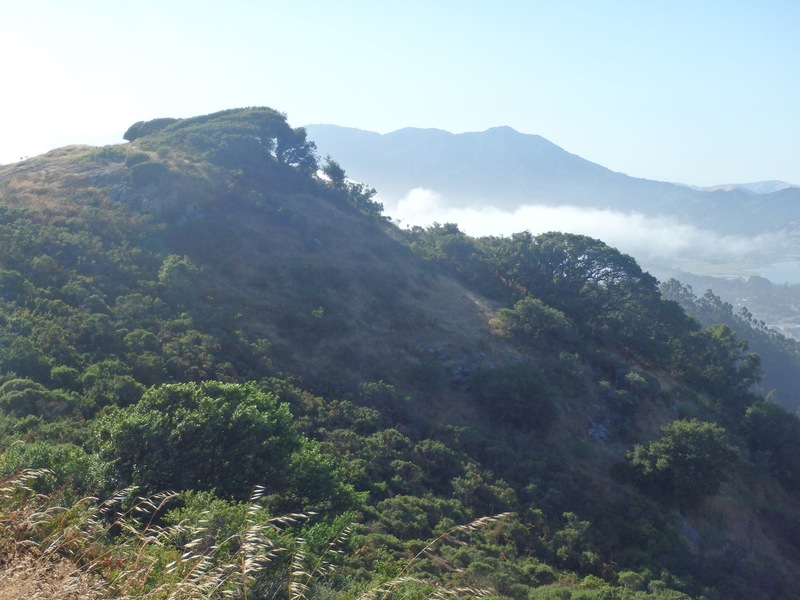 I did a short backpack trip from Sir Francis Drake Blvd at White Hill, south along the Bay Area Ridge Trail to Pantoll Ranger Station, about 30 miles. This is a continuation of my trip in June (Bay Area Ridge trail sections) where I ended at Pantoll because my feet wore out before my muscles. This was a bus to bus trip, catching the Marin Stagecoach bus Route 61 from San Rafael to the White Hill trailhead, and then Route 68 from Pantoll to Marin City. I love that there are such wonderful places I can get to on transit. From the crest of Drake Blvd between Fairfax and Woodacre, the trail climbs to the crest of White Hill ridge, first on a single track and then on old fire roads. Views open up in all directions, though cloud remaining from rain the night before were slow to clear. The trail wanders through an extensive area of serpentine soils with unique vegetation, including Sargent cypress, manzanita, chemise and Jepson ceanothus (a spiny plant a bit like white thorn ceanothus in the Sierra). If not for the cypress, it would look much like chaparral in other areas, but the species are mostly unique to serpentine soils, which have heavy metal concentrations and lack of soil moisture that create a unique ecosystem. Sacramento central city is actually doing much better on trash and recycle cans, but could do much better. Sacramento gets a zero on public restrooms (as in, not just unacceptable work, but the assignment never turned in) and a D- on drinking fountains. It is clear to anyone who looks that drinking fountains used by the homeless and low income are frequently broken, or dribble, but the ones in upper income neighborhoods always work. I cannot see this as other than intentional. You might think my rant is just about bias against homeless individuals, but this is discrimination against all citizens. It is a failure of government. The homeless suffer most from it, but we all suffer. This April I went into Grand Gulch for the first time, many years after hearing it was a place I had to visit. I’ve day hiked in the edges, and spent a fair amount of time on Cedar Mesa, especially Natural Bridges, but never backpacked there. Of course I have to wonder why I waited so long, it was great. 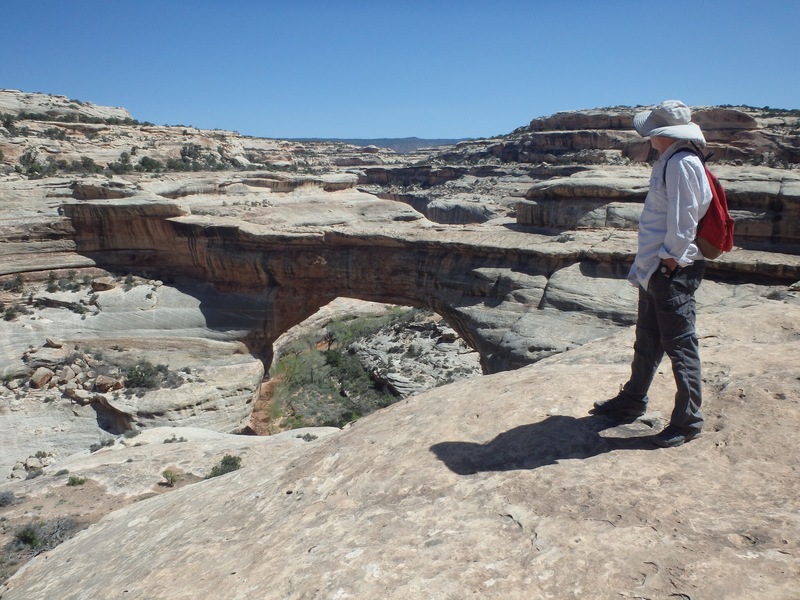 Since I’ve been car-free, I’ve spent much less time in southern Utah, but still managed to get there some years on spring break trips with Joe and Jeff. So this trip was also an experiment with public transportation that worked well. I took the Amtrak California Zephyr from Sacramento to Green River, then caught the Elevated Transit bus to Blanding, the hitchhiked to Kane Gulch. I was concerned about the hitching, and in fact all the cars in the afternoon were headed into Blanding and not out towards Kane Gulch. It took a while, though in vehicles passing before people gave me rides, it was only a few, and both were good rides. I picked up my permit at Kane Gulch Ranger Station, and headed down Kane Gulch, the most used entrance to the canyon system. I explored Junction Ruin, and up Grand Gulch and up Todie Canyon a short ways, and camped in an alcove at a ruin I called pack rat because of the huge pack rat middens filling two caves. Though I’d brought the Trails Illustrated map, I trimmed it down to just the canyon, without noticing I’d trimmed off the key to the numbered pins on the map, which give the names of ruins and other points of interest. Some of the larger ruins have registers with the name of the ruin and background information, but many do not. This ruin is actually named Badger, for unknown reasons. An archeological stabilization crew was working in the ruin, stabilizing walls that were starting to fail and replacing some mortar fixes from the 1970s that hadn’t worked well. After a night of scattered rain, I headed down canyon. Grand Gulch, at this time of year and this year, has intermitant water, areas flowing, areas of stagnant pools, and long stretches of dry wash. I didn’t realize it would be necessary to plan campsites and water pickups around availability, but it is. I explored Coyote Canyon, which has a use trail for a short ways. I camped early where two amphitheaters are opposite each other, marked by a beehive shaped rock formation (Utah, after all). The amphitheater on the west side looked like a cut-off meander, with a slot Canyon up against the towering wall. But it ends in a slickrock chute well above the canyon level and I’m at a loss to explain it. The bench in the middle of the amphitheater has some of the best developed cryptobiotic crust I’ve ever seen, and it was hard to traverse using little sandy rivulets and patches of bare rock. The night was very cold and bright with the moon, leaving my water bottles almost completely frozen. As I headed down canyon, box elders were leafed out, and eventually the cottonwoods as well, but in many ways the trees and flowers say it is early spring. 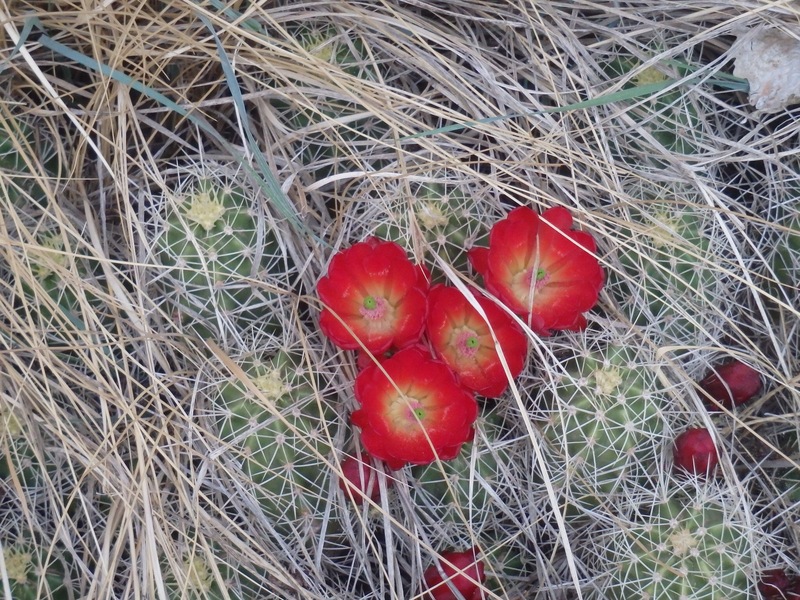 In the morning, walking a bit while finishing breakfast lentil soup, I walked up over a saddle and down Sheik’s Canyon. Not sure why this well worn use trail is there, if there were ruins I missed them. Almost every use trail in the canyons leads to a significant ruin. Places without ruins or only traces, no trails, no use. For me this is good, because I can make my own way to places that are beautiful but ruin-free. Of course there are not that many places without ruins. I walked down to Bullett Canyon, which has a well-worn trail probably the second most popular entry point, and a loop trip. Explored Green Spring Canyon below Bullett, as far down canyon as I went, only 18 of the 52 miles to the river. There is plenty of Grand Gulch yet to explore, and I’m happy with my slow progress, seeing a lot of details rather than covering distance and heading towards popular destinations. 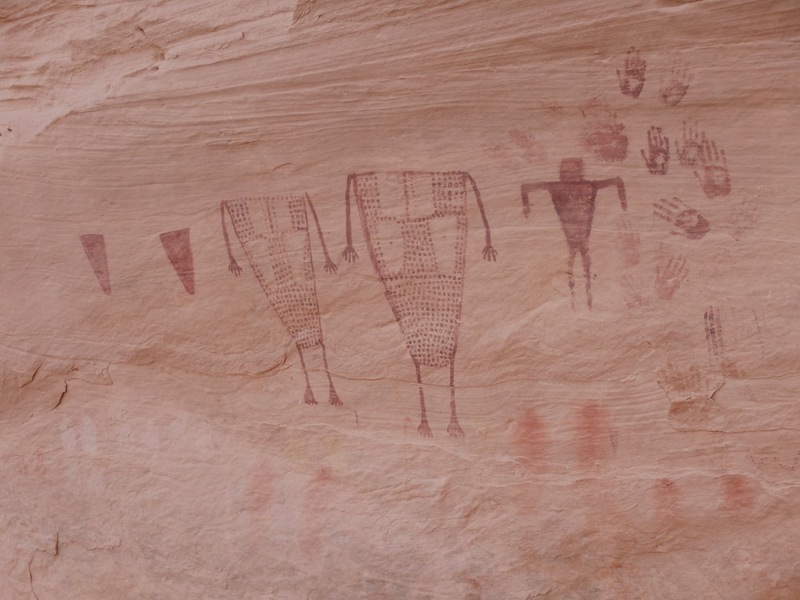 I camped in Sheik’s Canyon, with a crowd of people, the first time I’d seen more than a few scattered people. The reason for the crowd is the Green Mask Panel, the most impressive pictograph panel I’ve ever seen. Ledges have fallen away, so the panel is far above the ruin and canyon bottom, preserved by inaccessibility. The green mask, though notable for the unusual green color, is not the most impressive part. Heading back up canyon I explored some side canyons, and then the trail shown on the map in Todie Canyon. Though the trail is obvious at the bottom, it becomes obscure in willow thickets and across rock falls. Eventually it heads straight up the south wall of the canyon, well marked but nothing I’d call a trail. At the rim it heads east over the slickrock to an old road. This would not be a pleasant route with a backpack, though I guess makes an interesting day hike entry point, only two hours from road to bottom. There are some ruins in Todie so high up on the canyon walls that I wonder how useful they were, with no alluvial soil in the canyon and a long complicated climb up. In general, the ruins in Frand Gulch seem much less accessible than most places in southern Utah, perhaps more defensive, but these ruins are an outlier even from that. I wonder sometimes if during the ascendancy of Chaco Canyon, the population was subjugated for food and crafts rather than the beneficiaries or free trade. After a five day backpack, my friend Joe met me at Kane Gulch station and we did two days of car camping and day hiking. First day was North Mule Canyon just north of Hwy 95. Though similar to and almost as easy as South Mule Canyon, it gets a fraction of the use. As does every canyon on Cedar Mesa, there were some interesting ruins and petroglyphs, but the main attraction is just the beauty of the canyon, the pools and slickrock, the flowers and trees, and the sky. We camped out again, far up a road that faded out, cooking meals on Joe’s variety of little wood stoves, and telling stories far into the night. The second day we went to Natural Bridges National Monument, hiking the loop from Sipapu natural bridge to Kachina natural bridge and back across the mesa. Joe had not been here before and was amazed at how beautiful the canyons are, and though I’ve spent many days here, it is always good to see it with new eyes. We visited ruins in White Canyon that I had somehow missed seeing before. After one last night out, with Bears Ears on the horizon and the sky full of stars, we drove back to Las Vegas so I could spend Easter Day with my family, and then back to Sacramento on Amtrak. In June I hiked two sections of the Bay Area Ridge Trail, the two longest sections available so far. Of the ultimate 530 miles or so, 367 is completed, and the two longest sections are Kennedy Grove to Castro Valley, and San Francisco to Alta Loma. With the Sierra still deep in snow, the Bay Area was the perfect place to hike. There is a closed section of the trail in Huckleberry preserve, where the trail slid out last winter. Unfortunately, there is no information on the trail about an alternate route. I walked Pinehurst Road, and that worked, but I was uncertain and there was considerable additional mileage and climbing. I assumed that I had just missed notice of this on the Bay Area Ridge Trail website, but in fact there is no mention of it at all, despite the fact that the slide happened last winter. Grr. The next area of complaint is that the continuing trail turns onto EBMUD land at Chabot Staging Area. After wandering lacksidaisically up the valley, the trail heads straight up a fire road, so steep that I had to zig-zag just to make it up. How the association could call this part of the trail is beyond me. I was wondering why there were almost no footprints on the trail, and now I know, though ironically I did run into one other person who said it was the worst part of the trail she’d ever been on. An alternate route is to go out to Proctor Staging Area, but then one has to walk on the road down toward Castro Valley. At any rate, once down in town, you can catch a local AC bus, though I walked all the way to the BART station. From Castro Valley, I took BART to San Francisco, walked to the Golden Gate Bridge, and continued north along the other long section. This section, going through Golden Gate NRA and state park lands, is in much better condition. Of course I had to stop, as always, at Pelican Inn in Muir Beach, off the trail but well worth the side trip. I also walked through Green Gulch Zen Center, which I’d never visited before, very impressive gardens. I ended my trip at Pantoll Ranger Station where the Marin Stage stops and takes me down to Marin City and then on to the city, and back on BART to Richmond and home on Amtrak. I’m car-free, and love how much hiking and backpacking I can do in the Bay Area just by using transit. I stopped short of Loma Alta as my feet were worn out, being the first long backpack of the season, so I’ll go back in the fall to finish that piece from Pantoll to Loma Alta, where another Marin Stage takes me back to San Rafael.